The challenge handler tutorial demonstrates a few additional features (APIs) such as preemptive login, logout, and obtainAccessTokenForScope. You might also want to log in a user without any challenge being received. For example, you can show a login screen as the first screen of the application, or show a login screen after a logout or a login failure. Those scenarios are called preemptive logins. Note: The WLAuthorizationManager login() API has its own completion handler, the relevant handleSuccess or handleFailure methods of the relevant challenge handler ore also called. Note: The WLAuthorizationManager obtainAccessTokenForScope() API has its own completion handler, the handleSuccess or handleFailure of the relevant challenge handler are also called. The obtainAccessTokenForScope API takes in a scope. The scope can be the name of your security check. PreemptiveLoginSwift: An application that always starts with a login screen, using the preemptive login API. 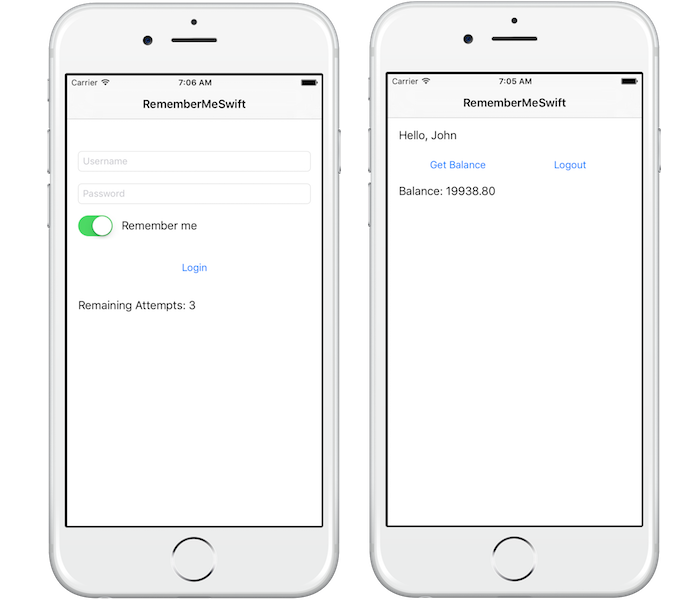 RememberMeSwift: An application with a Remember Me checkbox. The user can bypass the login screen the next time the application is opened.